The Veterans of the legendary WWII Jungle Skippers are affiliated with the 317th Veterans Group. The Jungle Skippers were the 39th, 40th, 41st and 46th Troop Carrier squadrons of the 317th Troop Carrier Group. They served with the 5th Air Force in the South West Pacific Area of Operations (SWPA). Flying the C-47 Skytrain, they transported troops, kept them suppied and evacuated the wounded. 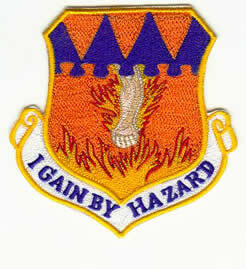 Their 317th crest bears the words "I Gain by Hazard". The Jungle Skippers of the 317TCG got the job done under the harsh conditions of New Guinea and the Pacific islands.